Judd determining the winner of a Turf War based on each team's total Battle Points. Battle Points, usually shortened to BP, Points, or simply P, act as experience awarded to players after completing a multiplayer match. These contribute towards the player's level, and are also the determining factor in the winner of Turf War battles. Points are primarily used to level up Inklings and unlock abilities. Points are also converted into cash, and can be used to purchase gear (such as clothes, shoes, and headgear) or buy weapons. Battle Points are counted at the end of every Turf War match to decide a winner, and are also used to fill the Special Gauge. In Splatoon, from level 1 to 20 Battle Points directly translated to the amount of exp earned to level up. From 20 to 50 the amount of Battle Points earned in Turf War and performance in Ranked correspond to a specific amount of EXP. Players can earn points in Turf War, Splat Zones, Tower Control, Rainmaker and Clam Blitz. In all the previously mentioned multiplayer, Battle Points are used to fill the Special Gauge which allow players to use their Special Weapon. 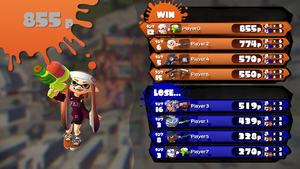 The results screen after a Turf War, ranking players by amount of Battle Points earned. 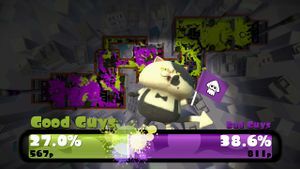 In Turf War, points are earned by covering ground with ink. Each stage has a set number of total Battle Points, based on the amount of land available for inking. However, players may easily earn more points than this amount because ink is often recovered by the opposing team. In a given match of Turf War, the team with the most turf covered after three minutes wins. Points are awarded based on the amount of turf covered by individual players, and as a bonus, 1000 points are awarded to each player on the winning team. Battle Points are based on the teams score, which is how much the team moved their counter for each mode's objective. The counter goes down by holding the control of the Splat Zones in Splat Zones, riding the tower in Tower Control, moving the Rainmaker close to the opponent's podium in Rainmaker, and tosing clams inside the opponent's basket in Clam Blitz. The players earn 5p pr. score point, where the winning team gets a win bonus depending on the player's rank and whether they scored a knockout. In Regular Battle, players are ranked on the results screen in terms of Battle Points earned. In Ranked Battle, every team member earns the same amount of points, so players are instead ranked by the number of splats they caused and how many times they were splatted. In the demo version of Splatoon shown at E3 2014, after a player splatted an opponent, the number of points earned from splatting them would show up where the player was splatted.